AN ARCHITECT REQUIRED several cuts in our roof to manage ventilation of toilets before we moved into our home. Because plumbers didn't do the work, we have problems seven years later. We didn't cross-check the work done in the final architect's report and now we're smelling the results. Like all homes, we have toilets with waste that passes through traps on large diameter Wavin pipes. The traps hold water in the bend of Wavin pipes. Our current problem is the main sewage pipes are venting foul air from outside of our home, largely because our unfinished housing estate has clogged drain runs and manholes that show a massive accumulation of waste from 82 homes. Normally the water sitting in the curve of the Wavin pipes under the toilets stops the back blast of bad air. And when toilets flush, water and waste enters the bowl, flows down the pipe and leaves the house. In our case, the soil pipe is not venting correctly. It is supposed to carry foul gasses up to and beyond the roof but it terminates in our attic and runs horizontally. This is wrong on so many levels. My DIY plan involves placing an Air Admittance Valve on top of an internal sewage vent pipe in the attic. 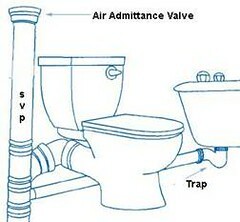 An Air Admittance Valve allows air from the room to be “sucked” into the pipe but does not allow the foul air to escape. I hope the current winter weather pattern continues in July so the working temperatures are bearable in the attic as I fit this valve in place. I know I might need a more comprehensive venting solution as we deal with this unpleasant smell. Here's looking at the exact attic loft vent we need. Bernie Goldbach should spend more hours in DIY.